Carola Karlsson, 33 years young. Are you a part of a team/club? Oh yes!  True Grit kettlebell club! What are you working with/as? I have recently changed job from fashion (MQ retail store clothes) to a company named Wibax there I´m selling chemicals. Do you have a motto or any catchwords? 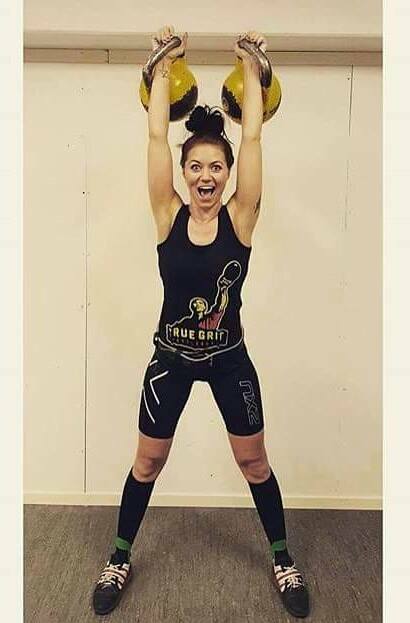 When did you start kettlebell training? Why and how did you start? I started in the beginning of True Grits start, in the garage 2013. We were a group of women and the thing then was to do good and effective workouts in so short time as possible. We trained about 30 minutes/time and did workouts like “7 minutes of hell” and tabata. But the “real KB-training = GS I started in spring? 2014. At first OALC (one arm) and in 2015 we started TALC (Two arm). Maybe more interesting, why did you continue doing it? At first it was all about the health/body. I have always been thin, but after 2 kids I started feel more tired and “loose”/fat inside the body, haha hard to explane but I think you understand And when I had train KB just about a few weeks I notice really fast a different on my health and body. And when Fredde introduced me to the GS I felt that I finally could have a goal. I need goals so I know what to work for. Have you entered any competitions? Do you want to share your results? Yes I have. The first “real” competition was SM 2014, it was OALC and I came in 2:nd place 16kg and 84(?) reps. After that competition I felt that too much time had gone on training before the competition and a lot of work and too little time with the family, so I didn’t plan to compete in SM 2015. I only trained when I felt that I had the time. But I was longing for goals and competitions so when it was about 2-3(?) months before the SM 2015 I decided to compete anyway. But now it was TALC, and I didn’t know if I would compete with the 12kg or the 16kg. I concluded to try with the 16kg bells. But now afterwards I know that I should have compete with the 12kg bells. I wasn’t really ready for 10 minutes with the 16. So at 8 minutes and some seconds my arms was so tired and cramped so I put them down. That was one of the worst disappointment I had ever felt on myself. But it still was enough to a 3rd place. Do you have a coach? Who is it and which are his/her strengths? What kind of education do you have in coaching? Certified by Fredde Instructor Level 1. What do you think are the most important personal qualities in an athlete? Will. If you don´t really want to, it´s hard to reach for goals. What do you feel about single/double bells for women? Double! I don’t see why we shouldn´t. But I think it´s good to train single sometimes also. Always good to vary. How do you think the future will look like for the sport (GS)? It´s seems to grow all around the world. And I hope it does. I think we are pretty good in Sweden to doing our best to spread it. We show us in the newspaper, in malls and so on. And try to do events so new people can try it out. So I really hope as many as possible will start train GS so it´s grow more. Before every competition I always have a goal, of course. But sometimes the goals can be to stand 10 minutes and sometimes X reps. Now I have a goal for the SM, but I keep that to myself a little bit longer. Which discipline do you like the most and why is that? The days when you don´t “have the time” or energy to train, but you fix the time and still go training. That´s really nice afterwards. It´s all about prioritize, you can be with your family and then train at home when the kids are asleep instead of sitting in the couch and looking on the TV or mobile for example. Prioritize. What do you think is the most challenging in training? It may not be as hard training as if I was in the gym with the TG gang, but at least it´s training. However I sometimes have resting days when I go on a trip with the family, I think that’s okey. But just for the training, I think it´s to fix the mentally, if you had a bad day and you fail in training, it´s hard to kick that stupid feelings away for the next time you are supposed to do the same exercise. Just remember that the days sometimes are like a roller-coaster, ups and downs. Just like the training. Do you have any training tips to share? Focus on your own. You can´t compare to someone else, train with people who bring you up, not down. And Have Fun! I must say that the whole True Grit gang inspire me in the gym. In so many different ways. It´s not always the one who lift the most heavy or most reps, it can also be a person who have had a hard day and still focus and try it´s best. When you see a person doing its best, because that´s the best a person can do, you can´t do more than that. Which exercise is your favourite? Have you got any exercises that you hate doing, or that your athletes hates doing? Which one and why is that? Everything that I´m not so good at. Is there ever anything that makes you not prioritize training day? How do you eat? Do you have a special diet or a food-philosophy? The last year I have been much better to eat good food. But I still eat candy and stuff like that. Sometimes more, sometimes less. 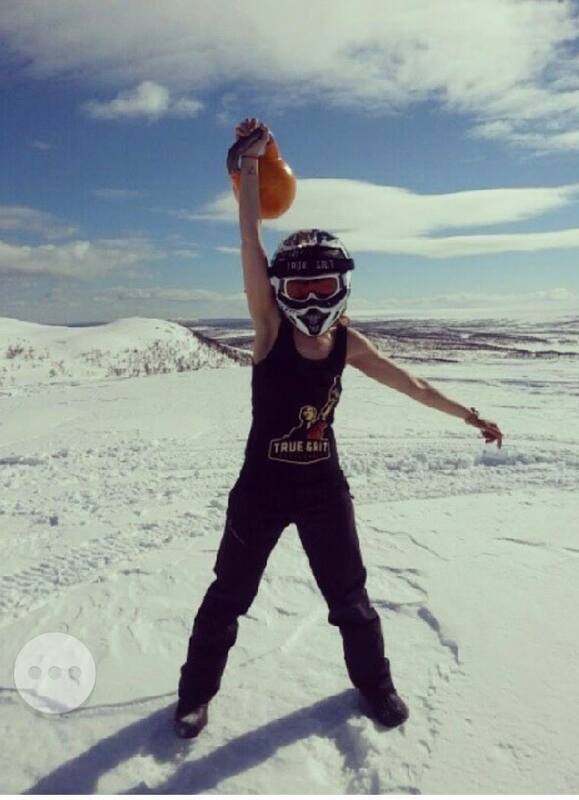 What is your favourite thing to do when you’re not ”kettlebelling” ? Travel, running or do something with family and friends. We thank Carola for sharing her thoughts about kettlebell with us. She always bring so much positive spirit to the gym and she is always very focused in our training sessions. It is admirable that she manage to train at home by here self when she cant come to the gym.